SCANLON HOWLEY & DOHERTY is a firm committed to providing preeminent civil litigation legal services to clients throughout Northeast and Central Pennsylvania. 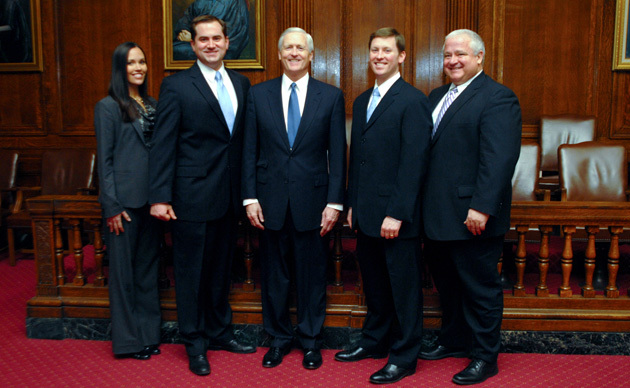 Our track record is unparalleled: Senior trial lawyer James A. DohertyJr., has tried more cases successfully to verdict than any other defense attorney practicing in this region. Expert in all facets of civil litigation, SHD attorneys also know and understand the region which they serve. For more than 75 years, the firm has been one of the most prominent law firms in the region. Our focus is on our client and meeting all their legal needs though diligent representation in personal and professional legal matters. SHD provides representation in the defense of medical and dental physicians, nurses, dental assistants and other health care providers, as well as hospitals, health care systems and institutions, and nursing homes. SHD has renowned experience in all aspects of workers’ compensation defense proceedings—from the time an injury is reported to an employer, until the claim is litigated to its conclusion. The workers’ compensation team, led by Attorney Thomas Nealon, has successfully handled thousands of workers’ compensation cases throughout Pennsylvania. Our firm also handles Auto & Trucking Litigation, Premises Litigation, Personal & Catastrophic Injury Litigation, Business & Commercial Litigation, Civil Rights and Constitutional Law. Our experience as trial lawyers, attention to detail, and focus on personalized service distinguish our firm. We understand how stressful it is to be involved in the litigation process; we’ll be at your side every step of the way, representing your best interests. We have cultivated a reputation as professional, detail-oriented, results-driven and dedicated lawyers. SHD is recognized throughout Northeast and Central Pennsylvania as an exceptional law firm that provides aggressive representation of our clients and invite new clients to contact our office at 570-346-7651.